So welcome to 2013, not my favourite number, but I’m glad we have all that Mayan nonsense out of the way. Lo and behold nothing happened. Or to be more precise more of the same continued to happen. More meanness, cruelty, deception, opinionated horse droppings etc etc. I dare say if we could turn the clock back to 2013 BC it would be much the same. Power, corruption and lies only a different flavour and some different empires in full flow…. Over the holiday season I’ve been busy avoiding the echo chamber of writers selling stuff to each other. It’s been refreshing. It’s also given me a chance to focus on book 2 – Sean Yeager, Hunters Hunted. The cover is nearly completed and I’m progressing well on the many passes of revision and updating. Not my choice of fun activity, but essential none the less. And even if I say it myself (and I am, ’cause there’s no one else here….) it’s a step up from the last book with loads of stuff going on. It is essentially an action, mystery adventure with lots of action and weird stuff. It’s funny to think this could be a future classic and so far no one but me has read it yet. More on that in future posts….. So above there’s a quick sneak preview of the cover while I continue the never ending rounds of revision. I’m also mind mapping out some ideas for book 3, which given the strengths of Hunters Hunted is going to be a challenge, a good challenge. It’s also the part I enjoy the most, so it’s all good. Yep, plotting is where it’s at people! Be afraid characters, be very afraid. Some nasty stuff will happen to some random people among you…. Ha ha ha! Happy 2013 and happy reading. This entry was posted in adventure books, author, book series, children's book, ebook, entertainment, fiction, future of print, great books, great new book series, middle grade, promotion, publishing, science fiction, sean yeager, sean yeager adventures, self publishing, teen read, tween read, writing, young adult, young fiction and tagged action, adventure book, book, book for boys, book news, book review, children's book, comedy, ebook, funny book, good book, good writing, great new book series, middle grade, mystery book, promotion, reaching readers, sci-fi, sean yeager, teen book, tween book, writing, young adult on January 17, 2013 by D.M. Jarrett. For those of you who are new to reading this blog (and that’s several billion of you) a quick recap. 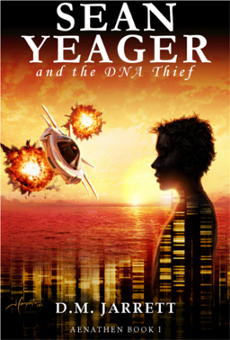 Sean Yeager began when I was trying to find some quality reading for my son. I struggled frankly. I was looking for an entertaining read that didn’t insult his intelligence and I failed. So I listened to what he was interested in and I went out again to look for something with him. In the end I let him choose. We bought some books and they were okay but not great. They were mostly read and quickly forgotten. One was dumped completely as ‘boring’. Eventually we settled on Harry Potter as being the best all rounder. (And to this day my main role model in a book alongside Bartimaeus). We talked some more and I wrote some short stories for my son about a boy called Sean Knight and how we helped to save the world. Surprisingly these were so well received I had a demand for a ring binder to store them in and some regular discussions about the characters and their gear. I shared the short stories with some friends to gauge how well they worked. Was it just youthful enthusiasm? The feedback came in and it was mostly positive. The stories seemed to have something. People understood the concepts and liked the angle. Next I did some research – I figured out the market, costings and what I could achieve realistically. I also set about finding an illustrator and began sketching some ideas myself. My first attempt with a cover designer was okay and I sort of received what I commissioned. I was chuffed to begin with. So I sent out loads of unsolicited submissions to agents and publishers. Not a single one was even vaguely interested in what I had written. Actually I fib, one sent me a vaguely positive rejection letter that implied they might consider my work sometime later in the year. Needless to say I did not receive any follow-up inquiries or feedback. Perhaps strangely I was not surprised in the least. I thought ‘this is why most of the books in the shops don’t sell very well’. Not that I thought my short stories were exceptional, more that no one would even recognise the gap in the market I was aiming for. Following a particularly ‘can’t be bothered’ piece of feedback from an agent I made a decision. I decided to take on the full responsibility for producing a professional product myself and to act like a professional. I set values and goals. I costed out the proposition and I researched. I planned to write two books inside a year and publish them in e-book and print. I also aimed for top quality plotting and writing together with top quality design and illustration. I realised it would be tough and I also realised it would take a lot of work. As it turned out I was right on both counts you need a lot of determination and a thick skin to be a writer. And that is where Sean Yeager and the DNA Thief began. I decided to change the character’s name because of a character called Sean Knight in a Mage comic. I wrote to the creator and in a trend that I have become very used to I received no reply. So I thought, ‘you know what change the name anyway and keep it straightforward’. In a way it was probably a good thing but at the time it was a complete pain to find and be happy with a new name. I wrote and revised for several months until I felt the first novel was complete. Several revisions and corrections later I lent it out to some beta readers and held my breath. The feedback was consistently positive with some helpful suggestions which I applied to the next revision. Being a whole lot more involved than a short-story I realised that the plots and characters were equivalent to a film script. I figured ‘why not?’ So I set out to write so the stories are easily adaptable to film and yet quirky at the same time. Which brings us almost up to date. I found a very talented illustrator and commissioned a new cover and some interior images. The interiors became material for website and posters when I realised how expensive colour printing can be. Needless to say the second cover was massively better than the first and you can see it above. Sean Yeager Adventures has an e-book on each of the major sites a website, a blog, twitter, facebook, even a spoof advert on youtube and various postings all over the internet. Do any of them attract readers? Good question. If people want to find out about Sean Yeager I believe they can and will. So probably. Will social media sites sell people the books? I think people decide for themselves in the real world. I encourage people to read the free preview and see the website. And guess what? Many of them do. Soon they will be able to hold a printed copy in their hands (hurray!). Yes Sean Yeager will soon be arriving in print. Then libraries and then (hopefully) some high street shops and book clubs. Meanwhile the second book is nearing first draft completion and promises to be every bit as good as the first and more expansive. Perhaps by the fifth draft it will reach the light of the internet and print outlets. When the quality is good enough that is. So Sean Yeager takes over the world….. yes he does. It’s what the series is all about. I’ve set my aims high to entertain, stretch minds and be as good as the best. All that’s left is the blood, sweat and tears to push on and achieve those goals. And why have I done this? Because I believe readers deserve a really compelling book series and it all goes back to what my young readers told me they wanted to read about. I also have a ball writing the stories which makes up for the rejections and emails I’ve sent that have gone unanswered. I laughed recently about The Beatles’ first rejections, it clearly happens to everyone. Yesterday I took some promotional postcards to a school and a boy asked for another one because he lost the first. He’d yet to read a word of the story and yet he loved the idea of the book simply based on the cover. Priceless. Yes, Sean Yeager is taking over the world, you heard it here first. This entry was posted in adventure books, author, bartimaeus, book series, children's book, ebook, entertainment, fiction, future of print, great new book series, harry potter, middle grade, promotion, publishing, sean yeager, sean yeager adventures, self publishing, teen read, tween read, writing, young adult, young fiction and tagged adventure book, book, book for boys, book news, children's book, ebook, funny book, good book, good writing, great new book series, middle grade, mystery book, promotion, reaching readers, sci-fi, sean yeager, teen book, tween book, writing, young adult on November 23, 2012 by D.M. Jarrett. 1) Characters are the backbone of your story, more so than plot they will shape and carry your ideas. Build them, understand them, listen to them and follow where they lead you. I can vouch for this personally now that I have my own Sean Yeager characters baying for action and plot twists of their own in book 2 Hunters Hunted. Some even want their own stories written (steady on there!!!). 2) Write free-form or with structured notes and try mixing up both methods for best effect. Never be afraid of trying what works best for you, writing is like daydreaming with words. I can vouch for the mixed approach – try a bit of both because it gives confidence that you know where you are heading while at the same time giving freedom to develop the story as you progress. 3) Whatever you do sit down and write. It’s all about practice and improving what you write therefore you need to do it if only for a short period every day. Never pretend you need a muse to write. 4) Be disciplined and write to a deadline, if you have professional aspirations write like a pro and get the job done. Publishers will set deadlines and therefore you need to learn to write to them yourself. 6) Develop a steel skin for the inevitable criticism and rejection, they come with the territory. Better still ignore reviews and concentrate on the constructive feedback you receive. 8) Look after yourself – your posture, back, wrists, health they all matter. Remember a healthy body is a healthy mind. Or put another way – It’s a marathon not a sprint. (my comment added in there). 10) Research thoroughly or you’ll be caught out. Enjoy it as well it is a perk of the job. 11) You need to read other books as well to write. Why? Well this took me a while to figure out – my conclusions are – Because you need to focus on use of language, stretch your own writing muscles and to gauge the benchmark or better still inspirations for your writing. Getting into the zone is best achieved through both writing and reading quality books. 12) And my personal favourite – ALWAYS carry a notebook, write down what you see, hear smell, think. Anything useful to your world of creating stories. Then collate the best ideas in your home book or spreadsheet. Personally I go on long walks and ask questions of my story and write down the answers such as – So what about x? What’s the story about? Why should anyone care about x? What’s the strangest thing that could happen next? etc etc. I hope you find these tips useful, they certainly resonated with me. This entry was posted in author, book series, fiction, great new book series, middle grade, publishing, sean yeager, self publishing, teen read, tween read, writing, young adult, young fiction and tagged adventure book, book, children's book, ebook, great new book series, middle grade, promotion, sean yeager, teen book, tween book, writing, young adult on November 13, 2012 by D.M. Jarrett.